Meade 4K Eyepiece & Filter Kit 2"
Meade Series 4000 Eyepiece and Filter Set #607010. Complete set of the most popular accessories for your Meade telescope. This comprehensive kit makes accessorizing a snap. 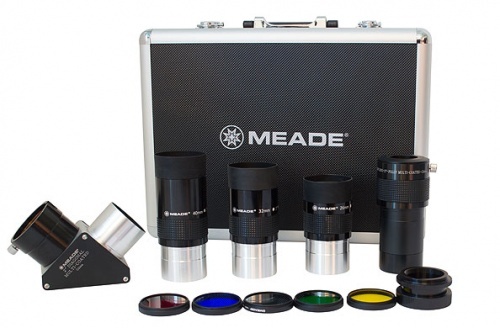 Includes three Meade Series 4000 Eyepieces in focal lengths of 26mm, 32mm, and 40mm. All eyepieces feature a 3-element, Fully Multi-Coated 2" barrel size. The 26mm and 32mm eyepieces have a 56° apparent field of view, and the 40mm eyepiece has a 50° APOV. 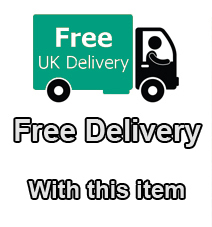 Each also features has a soft rubber eye guard for comfort. This complete kit additionally includes a 2" 90° diagonal mirror with SCT/ACF and 2" slip fit focus adapters, a 1.25" eyepiece adapter, and a Meade 2x Barlow lens to double the power of any of the included eyepieces. Also included are four colour filters: Deep Yellow, Red, Light Green, and Blue. A black carrying case is included as well to keep it all clean and organized. This is truly an instant observing kit, and represents an incredible value over buying even a few of the items individually. 26mm 2" Eyepiece, 56° apparent field of view. 32mm 2" Eyepiece, 56° apparent field of view. 40mm 2" Eyepiece, 50° apparent field of view. 2" Diagonal Mirror for SCT with slip-fit adapters.